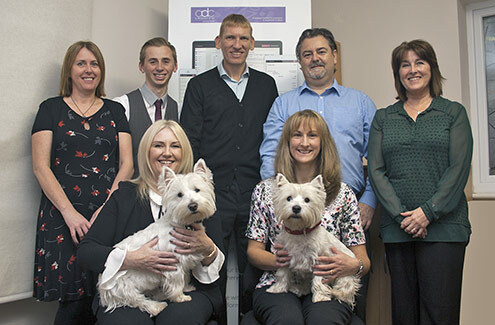 At A Dickinson & Co Accountant, Standish, Nr Wigan we have a team of highly experienced staff to meet almost any accountancy need any business may have. We’re a friendly yet professional team always ready to answer any questions you may have about your accounts. 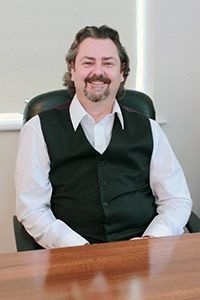 Ian has been in practice for too many years to remember and has had exposure to pretty much all forms of tax planning and tax related matters from basic enquiries to full Special Compliance Office investigations. Ian will be the first to tell you that although accounts production is a necessary evil it is basically historic information (a good benchmark for future planning) and he is far more interested in how his clients are performing now and what their future plans are. It is only with this insight that we can provide bespoke, tax efficient planning. It’s always best to finish on a ‘light’ note so here we go – Ian is married with three ‘delightful’ children, a dog, a cat, a goldfish and too many welsh mountain show ponies!!!! Because of the above Ian has no free time to fill with other possible delights such as golf, watching football or drinking! 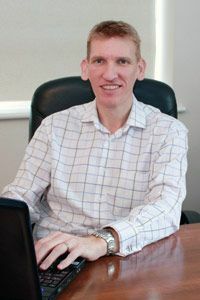 Steven’s career in Accountancy began over 20 years ago. He cut his teeth working for a firm of Accountants in Preston, when he first met Ian. Progression through the ranks meant experience of a whole range of accountancy and taxation issues ranging from the smallest sole trader to much larger listed companies. Following a common route for accountants qualifying in practice, Steven decided to try life on the other side of the fence and spent eight years as a Financial Controller for a couple of manufacturing companies. Initially a small local company followed by a multi-national American owned organisation. This combination of employment has given him a rounded understanding of the ‘ins and outs’ of business at many different levels. When he isn’t wearing his Accountants hat you may well find him indulging his other passion of playing golf, with varying degrees of success. Chris joined A Dickinson & Co in July 2013 after leaving Cardinal Newman College, Preston. He has started his ACCA Qualification attending college one day a week. 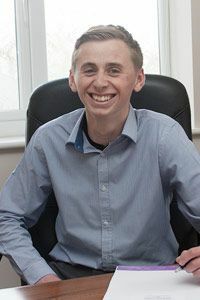 Whilst working for Dickinson’s Chris has learnt basic payroll and accounts preparation skills and plans to further his knowledge over the coming years. Chris is a qualified level one football coach & is currently assistant coach to a local junior football team. He is also a qualified referee. Chris is a Liverpool FC supporter & a keen cyclist (when the weather’s good!!!). Chris has travelled to Lourdes for the previous 4 years volunteering as a Youth Pilgrim assisting the sick & elderly. The only downside to working at Dickinson’s is that he has to work with his mum, Cath. Although he has had to count to ten on numerous occasions, on the up side he is benefiting from free travel costs to work every day & a home-made packed lunches! After leaving school Brenda trained as a Secretary which led her to working at Leyland Daf in Chorley as a Clerical Officer. After leaving when the company went into liquidation Brenda spent the next 5 years bringing up her children. In 1998 she started work for E Heys & Co Accountants (she was the & Co!) 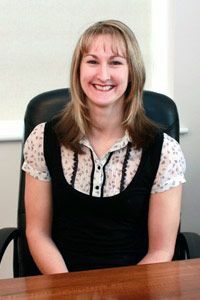 and whilst here she gained AAT Intermediate Qualification and experience in preparing accounts, VAT returns and payroll. Brenda came to work for ADC Accountants in November 2012 due to Mr. Heys retiring. She is married with two grown up daughters and a new grandson. When not doting on her grandson Brenda enjoy reading, Pilates and walking her very hyper Parson Jack Russell, Milo, or it could be said, he walks her. Catherine joined A Dickinson & Co after leaving school at 16 and initially began work as a cashier for the then Bradford & Bingley Building Society Agency (now Santander) we share a building with. 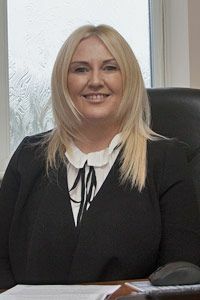 Whilst working for the Building Society she gained her accountancy qualifications and transferred to the accountancy practice, where she has gained a wealth of experience. 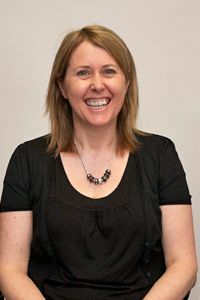 In addition to the normal accounts preparation Catherine also helps our clients with bookkeeping and also provides them with Sage support & training. Outside the office Catherine is an active member of Wigan Sailing Club where she sails most Sundays and has been club secretary for 7 years. Cath left school and began work as office junior at an accountants in Leyland where she worked her way up to the position of senior accounts assistant. Whilst there, she used SAGE and QUICKBOOKS and has gained experience in bookkeeping, payroll, VAT and accounts preparation. After 13 years she felt it was time for a change and left to enjoy the position of Financial Director within a local textile company. Due to the decline of the textile industry she felt it was time to move again and has joined A Dickinson & Co in November 2010. She is married with three children and is an avid Manchester City fan!! As well as football Cath still likes to watch Wigan Rugby League and enjoys watching or joining in with most sports (apart from GOLF!!). She likes to keep fit by jogging around the local streets – usually when it’s gone dark!! After Jayne left school she started her career in accountancy as an office junior at a firm accountants in Chorley – working her way up to accounts clerk. After a break to raise her daughter she spent the next 11 years at an accountancy practice in Wigan where she prepared accounts for sole traders, partnerships and limited companies. 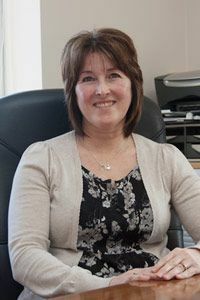 Due to changes of ownership Jayne felt it was time for a change and started to work at ADC Accountants in September 2015. Jayne is married with a teenage daughter and two pugs. She spends most of her free time shopping and walking her dogs . 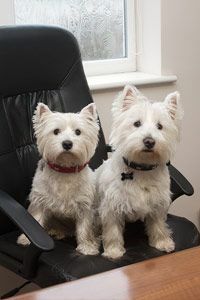 Milly & Mandy are our new security consultants (guard dogs if you can believe that!) – replacing Molly after her retirement. on occasion they provide some planning ideas that people might regard as maybe a bit wroof and somewhat barking. 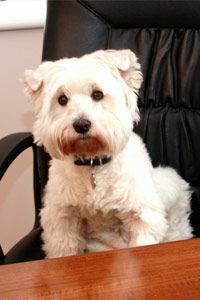 One thing is for certain all our clients are greeted with a smiling face and wagging tail’s! Molly has now retired and taking a well-earned break.